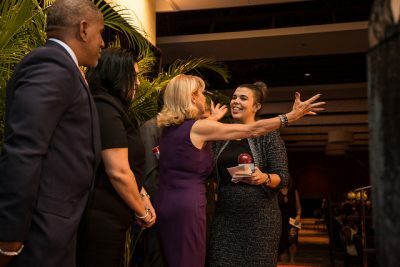 Miami-Dade County Public Schools named two FIU alumnae the runners-up of its Teacher of the Year and Rookie Teacher of the Year awards. The runner up awards, given by United Teachers of Dade President Karla Hernandez-Mats, included recognition at a Jan. 26 dinner ceremony and a cash prize donated by Superintendent Alberto Carvalho. Laura Ortiz ’03 was named the runner-up Miami-Dade County Teacher of the Year. 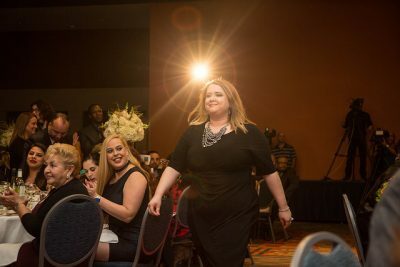 Laura Ortiz ’03, the runner-up Teacher of the Year, said she lives for the moment when someone she is teaching makes such a strong connection to the lesson being taught that their face lights up. Ortiz herself lights up at opportunities to help bring lessons to life, often by taking them to different cities and visiting some of the country’s most renowned museums. Recently, Ortiz assigned her students a project where they illustrated the journey of a slave using websites and apps. She has also mentored her fellow teachers on how to incorporate technology on their classrooms to so they can also help prepare students to one day enter a global work force. Davalyn Suarez ’09 (far right) was named the runner-up Miami-Dade County Public Schools Rookie Teacher of the Year award. Davalyn Suarez, ’09, meanwhile was named the runner-up Rookie Teacher of the Year. Suarez found teaching accidentally, interviewing for a position at Shenandoah Middle School after a friend told her about a temporary teaching vacancy. Soon she found a permanent teaching position at Miami Senior High, her alma mater. Aside from teaching English classes, Suarez is also the school’s debate coach and puts in extra hours at night and on weekends coaching students for upcoming competitions. It’s paid off. Her students recently won first place at a Miami-Dade Urban Debate League competition.